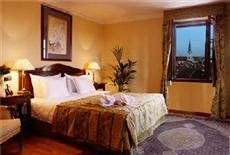 The Golden Well Hotel is a luxury Prague boutique hotel enjoying one of the best locations in the city. The Golden Well Hotel offers a superb choice of luxury prague accommodation with 17 rooms and 2 suites all reflecting the building's rich heritage and providing our guests with incomparable views, luxurious accommodation, exceptional service and exclusive amenities. The Golden Well Hotel, our luxury Prague hotel is located below the walls of the Prague Castle and surrounded by the Castle rose gardens in the quaint Mala Strana or the "Little Quarter" of Prague. Close to the Prague Castle and the Czech Parliament we are just a short walk away from some of Prague's most impressive sights, including the Prague Castle, the Charles Bridge, the Royal Gardens, the St. Nicholas Church and the Old Town Square. Guests of The Golden Well Hotel are privileged in the summer months to use the Emperor's private entrance that leads directly to the gardens of the Prague Castle. Wander up the cobbled, traffic-free streets to The Golden Well, clinging to the wall in the shadow of Prague Castle, and you will uncover one of the city's best kept secrets.